Both amateur and professional players quickly took notice of the logic of the LockTone™ system as well as other improvements such as the non-rotating ¼” output jack and ProBucker™ humbuckers. Even Mr. Les Paul himself—an avid fan of the modern Epiphone era—loved the new generation of Les Pauls that offered players the “sustain for days” that Les dreamed of when he constructed his first solid body electric guitar, “The Log,” in 1940. Epiphone regularly sent our modern Epi Les Pauls to Les’ home in New Jersey to get his critique. Today, many players chose Epiphone for the high standards of build quality, hardware, and pickups, and count on the House of Stathopoulo’s boundless enthusiasm for taking chances. 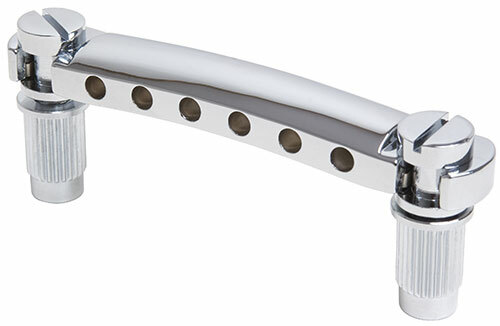 The original Tune-o-matic bridge was first used on the Gibson Super 400 before becoming the standard bridge for Les Pauls in 1954 with the Les Paul Custom. The bridge was created during the early 1950s when Ted McCarty (who had earned an engineering degree from the University of Cincinnati) served as President of Gibson and later Epiphone (which McCarty purchased from the Stathopoulo family in 1957), a post McCarty held until the mid 60s. It was McCarty who helped guide the companies through the transition from the big band era into rock and roll. (As Joe Bonamassa once said, “McCarty is a kind of rock and roll hero to all of us who play guitar.”) McCarty was a ‘hands-on’ presence at the legendary Gibson & Epiphone factory in Kalamazoo, Michigan and instrumental in the creation of the Tune-o-matic bridge and along with Seth Lover, the humbucker pickup, as well as the Les Paul, SG, Flying-V, and the ES-series guitars. All were sparked by McCarty’s inventive imagination and competitive spirit. 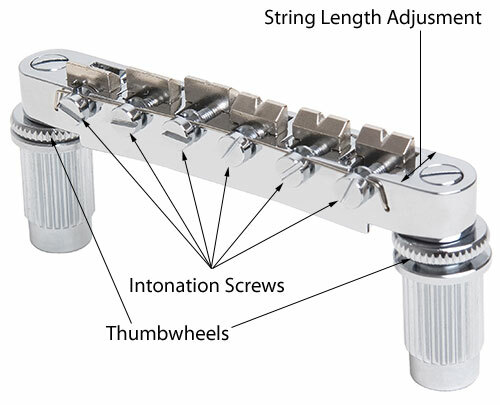 The Tune-o-matic bridge allows players the ability to easily adjust each individual string length using the six corresponding screws. 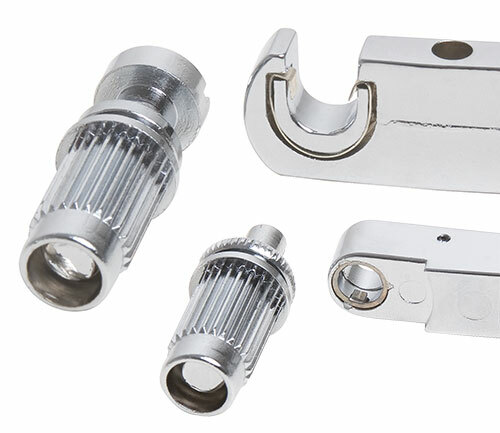 Two thumbwheels allow for bass and treble string height adjustment while two large bolts securely mount the bridge directly into the wood of the guitar, effectively transferring string vibration and tone. Richard Akers, head of Epiphone’s Research and Development team, noted that creating the new LockTone™ Tune-o-matic bridge was initially part of an overall re-assessment of the entire Epiphone building process which began around 2000. 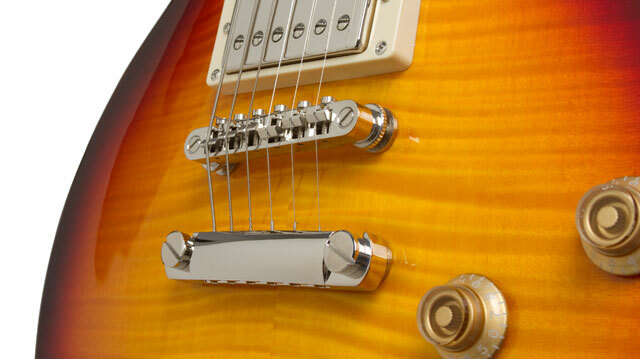 The original mission was to ensure that every Epiphone part—from the toggle switch to the smallest screw—was reliable, well designed, and contributed to the overall value of the instrument. Much to the delight of Akers and his colleagues, the LockTone™ not only made adjustments fast and reliable but also added to the overall sustain of the instrument. Another inspiration for creating the LockTone™ was simply practical. During string changes, both the Tune-o-matic and the Stopbar would often fall off of their anchor bolts. (Try looking for a small but vital part of your bridge as it rolls away on a dark stage in the middle of a gig.) The LockTone™ makes it possible to "lock" both the Tune-o-matic and the Stopbar on their posts without the need for tools and automatically eliminates accidental drops while also adding to tone and sustain. Tests confirmed that the tighter the fit of the Tune-o-matic and Stopbar on their posts and the greater surface area contact, the longer the instrument would sustain with a better overall tone. Check out the results of our tests using the LockTone™ system. For the first test, we plucked a string and recorded the signal using Sonor™. After the signal was captured, we analyzed the waveform using Sound Forge™ and made note of the RMS power (in dB) of the signal at impulse for 0.1 seconds and then made note of the RMS power for 0.1 seconds at five seconds from impulse. At this point we calculated the drop in decibels from impulse to five seconds for each string. Over three trials, we listed the average drop (over the three trials) for each string and then the overall average of the three strings combined. 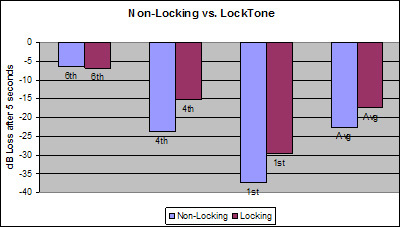 Based upon these findings, the LockTone™ system showed an increase over the original non-locking system of about 5 dB better after five seconds. We also noted that high strings do not sustain as well as low stings since high frequency signals are dampened much quicker than low frequency signals. This also plays a large part in how well harmonic content is perceived in a signal. If you look at only the 1st string, the increase in sustain using the LockTone™ system was over 7.5 dBs higher than the original Tune-o-matic. Thanks to the work of Epiphone’s staff and their passionate pursuit of excellence the House of Stathopoulo continues to improve every aspect of our instrument design. Watch the classic video by Dr. Epiphone and check out an Epiphone Les Paul, SG, or ES-style archtop for yourself at your nearest Authorized Epiphone Dealer.